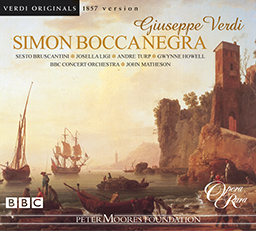 Simon Boccanegra, the second volume in the Verdi Originals series, is set in 14th Century Genoa and explores the political intrigues of the times, centred on the discovery of the true identity of Amelia Boccanegra. Simon Boccanegra, the second volume in the Verdi Originals series, is set in 14th Century Genoa and explores the political intrigues of the times, centred on the discovery of the true identity of Amelia Boccanegra. This original 1857 version predates the revision by 24 years and represents Verdi’s most extensive alterations to one of his operas, making this original version a must for all serious collectors of 19th century Italian opera. The 1976 broadcast presented the original version, almost certainly the first time it had been heard for over a hundred years. 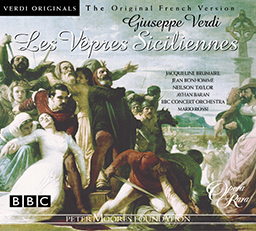 In recent times, for various Verdian celebrations, there have been concert performances but this is the first official appearance of the original version on disc. The title role is sung by the remarkably versatile Sesto Bruscantini, a great artist who died in the spring of 2003. He is supported by a wonderful cast including three exceptional British singers: baritone William Elvin, alongside basses Paul Hudson and Gwynne Howell. John Matheson conducts the BBC orchestra and the BBC singers. 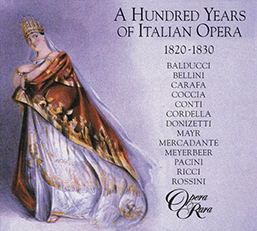 The opera is accompanied by a fully illustrated 200-page booklet, in four languages (Italian, German, English and French) with an introduction by Opera Rara’s late Artistic Director, Patric Schmid, and an insightful article by Verdi expert, Roger Parker. Sesto Bruscantini, Josella Ligi, Andre Turp, William Elvin, Gwynne Howell, Paul Hudson, BBC Singers, Conductor John Matheson. The opera is set in Genoa at a time when the city was ruled by opposing groups of patricians and plebeians. Against a background of political conflict is the personal enmity between the plebeian Simon Boccanegra and the patrician Fiesco. Boccanegra is a famous corsair who has led successful raids on Genoa’s enemies. He fell in love with Maria, Fiesco’s daughter, and they had a child. Fiesco forbade Maria to marry Boccanegra, who is of lower rank, and imprisoned her in his palace; the baby is being raised by a nurse outside the city. Fiesco’s cruel attitude to Maria is widely known. Paolo, a plebeian, plans to exploit Boccanegra’s love for Maria to gain power for himself. Paolo and Pietro are discussing nominations for the plebeian candidate in the coming election of a Doge. Paolo’s choice is Simon Boccanegra. Boccanegra arrives. Paolo persuades him to stand: if he becomes Doge, Fiesco could no longer refuse him the hand of his daughter Maria. Pietro rallies a crowd of citizens and persuades them to support Boccanegra. Fiesco comes out of his palace. Maria has died, and he swears vengeance on the man who has destroyed his family and taken his beloved daughter. Boccanegra appears and is confronted by Fiesco, who does not tell him of Maria’s death. Boccanegra offers reconciliation, but Fiesco says he will only forgive h im if Boccanegra lets Fiesco have his granddaughter. Boccanegra refuses: he explains that the child has vanished. The two men part in anger. Fiesco lets Boccanegra discover Maria’s body. At that moment the people pour in, hailing Boccanegra as the new Doge. 25 years have elapsed. The Doge has exiled many of his political opponents and confiscated their property. Among these enemies is Fiesco, who has been living in the Grimaldi palace plotting with other nobles to overthrow Boccanegra. Years earlier, the Grimaldi family discovered an orphan being cared for in a convent: with no idea of her real identity – she was the daughter of Maria and Boccanegra – the Grimaldi’s adopted her. They hoped that by pretending she was their daughter Amelia, who had just died, they would have an heir to their family fortune, their sons having been exiled. Amelia is waiting for her love, Gabriele Adorno, a nobleman whose father was killed by Boccanegra. Suspecting him of being involved in a political conspiracy against the Doge, Amelia warms him of the possible consequences. An unexpected visit from the Doge is announced. Amelia, who fears the Doge has come to force her to marry Paolo, urges Adorno to ask Fiesco for permission to marry her. Fiesco arrives; he agrees, telling Adorno of Amelia’s adoption. Adorno, however, is undeterred, and the two leave. Boccanegra enters. He surprises Amelia by granting a pardon to her exiled brothers. She confesses that she loves Adorno and will not marry Paolo. She tells Boccanegra that she was adopted, and as she relates what she knows of her early life, Boccanegra realizes that she is his long-lost daughter. They are overjoyed to have discovered each other. When Paolo enters, Boccanegra tells him to give up any idea of marrying Amelia. Enraged, Paolo arranges for Amelia to be kidnapped. Amid the festivities of the harbour the Doge appears and is interrupted by Fiesco and Adorno who accuse him of abducting Amelia. At the climax of the scene, Amelia herself appears, protesting the Doge’s innocence; she narrates her abduction but refuses to reveal who was responsible. All join in calling for the perpetrator to be brought to justice. Paolo tells Pietro to fetch Adorno and Fiesco, whom he has arrested for treason. Paolo urges Fiesco to murder Boccanegra while he is asleep. Fiesco refuses and is taken back to his dungeon. Paolo, suggesting to Adorno that Amelia has been brought to the Doge’s apartment because she is his mistress, now hopes to incite Adorno to murder Boccanegra. Alone, Adorno rages against Boccanegra. Amelia enters. Adorno accuses her of being unfaithful. She cannot fully reassure him, though, without revealing that she is Boccanegra’s daughter. As Boccanegra approaches, Adorno hides. When Amelia says to Boccanegra that she would die for Adorno, Boccanegra agrees to pardon him, even though he is part of the conspiracy against him. Boccanegra, alone and weary, falls asleep. Adorno is about to stab him when Amelia return to stop him. Boccanegra wakes. He tells Adorno that Amelia is his daughter. Adorno, astounded, begs Amelia’s forgiveness and pledges his life to the Doge. Shouting is heard; the rebellion has started. Boccanegra bids Adorno join his comrades, but Adorno swears allegiance to the Doge. Boccanegra orders him to quell the fighting: if he succeeds, Amelia will be his reward. The uprising has been put down. Adorno has distinguished himself in Boccanegra’s service and will be rewarded. Pietro whispers that he has made everything ready and Paolo orders the murder of Boccanegra. A wedding chorus is heard. Paolo tells Fiesco that he has poisoned Boccanegra and that Fiesco should flee if he does not want to be implicated. Fiesco is horrified but refuses to leave. Boccanegra is now succumbing to the effects of poison. Fiesco comes forward and confronts him. Boccanegra recognizes the voice of his hold enemy. He is overjoyed that they can now be reconciled and tells Fiesco that Amelia is his granddaughter. Fiesco, overcome with remorse, reveals Paolo’s treachery. Adorno and Amelia arrive from their wedding to find old enemies at peace with one another. Boccanegra summons the strength to tell Amelia that Fiesco is not her guardian but her grandfather. As Boccanegra dies, he names Adorno as his successor as Doge. Die Oper spielt zu der Zeit, als Genua unter der Herrschaft von rivalisierenden Patriziern und Plebejern stand. Der politische Konflikt bildet den Hintergrund der persönlichen Feindschaft zwischen dem Plebejer Simon Boccanegra und dem Patrizier Fiesco. Boccanegra ist ein berühmter Korsar, der erfolgreiche Kaperfahrten gegen die Feinde Genuas angeführt hat. Er verliebte sich in Fiescos Tochter Maria, mit der er ein Kind hatte. Fiesco untersagte Maria die Vermählung mit Boccanegra aus Standesgründen und sperrte sie in seinem Palast ein; das gemeinsame Kind wird nun von einer Amme außerhalb der Stadt aufgezogen. Fiescos grausame Haltung gegenüber Maria ist allgemein bekannt. Paolo, ein Plebejer, will sich Boccanegras Liebe zu Maria zunutze machen, um selbst an die Macht zu kommen. Paolo und Pietro unterhalten sich darüber, welcher Plebejer zum Kandidaten für die kommende Dogenwahl ernannt werden soll; Paolo spricht sich für Simon Boccanegra aus. Dieser kommt hinzu. Paolo überredet ihn, zur Wahl anzutreten: Wenn er Doge wird, könnte ihm Fiesco die Hand seiner Tochter Maria nicht länger verwehren. Pietro schwört eine versammelt Menge von Bürgern auf Boccanegra ein. Fiesco kommt aus seinem Palast. Maria ist gestorben, und er schwört, sich an demjenigen zu rächen, der seine Familie zerstört und ihm die geliebte Tochter genommen hat. Als Boccanegra auftaucht, stellt Fiesco ihn zur Rede, verschweigt ihm aber den Tod Marias. Boccanegra bietet ihm Versöhnung an, doch Fiesco will ihm nur unter der Bedingung verzeihen, dass er ihm seine Enkelin überlässt. Dazu sieht Boccanegra sich außerstande, da das Kind verschwunden ist. Die beiden Männer scheiden im Zorn. Fiesco verfolgt kaltblütig, wie Boccanegra den Leichnam Marias im Palast entdeckt. In diesem Augenblick strömt das Volk herbei, um Boccanegra als neuem Dogen zu huldigen. 25 Jahre später. Der Doge hat viele seiner politischen Gegner in die Verbannung getrieben und sich ihrer Güter bemächtigt. Unter diesen Gegnern ist auch Fiesco, der im Palast der Grimaldi lebt, wo er zusammen mit anderen Adeligen den Sturz Boccanegras plant. Jahre zuvor hatten die Grimaldi eine Waise entdeckt, die in der Obhut von Nonnen aufwuchs: Ohne ihre wahre Identität zu kennen – es war die Tochter Marias und Boccanegras –, adoptierten sie das Mädchen. Die Grimaldi wollten sie als ihre gerade gestorbene Tochter Amelia ausgeben und damit über eine Erbin verfügen, auf die das Familienvermögen übergehen kann, da alle Söhne in der Verbannung lebten. Amelia wartet auf ihren Geliebten Gabriele Adorno, einen Adeligen, dessen Vater von Boccanegra getötet wurde. Sie argwöhnt, dass er in eine politische Verschwörung gegen den Dogen verwickelt ist, und warnt ihn vor den möglichen Folgen. Ein unerwarteter Besuch des Dogen wird angekündigt. Amelia befürchtet, der Doge sei gekommen, um sie zur Vermählung mit Paolo zu zwingen, und bedrängt Adorno, er möge Fiesco um Erlaubnis bitten, sie zu heiraten. Fiesco kommt hinzu; er willigt ein und erzählt Adorno von Amelias Adoption. Adorno lässt sich davon jedoch nicht beeindrucken, und beide gehen ab. Auftritt Boccanegra. Zu Amelias Überraschung begnadigt er ihre verbannten Brüder. Sie bekennt ihre Liebe zu Adorno und sagt, dass sie Paolo nicht heiraten wolle. Sie erzählt Boccanegra von ihrer Adoption, und während sie ihm von ihrem früheren Leben berichtet, wird Boccanegra klar, dass sie seine lang vermisste Tochter ist. Beide sind überglücklich, sich wiedergefunden zu haben. Als Paolo eintritt, sagt Boccanegra ihm, er solle jeden Gedanken an eine Heirat mit Amelia aufgeben. Außer sich vor Wut veranlasst Paolo, dass Amelia entführt wird. Inmitten der Festlichkeiten am Hafen wird der Doge von Fiesco und Adorno zur Rede gestellt; sie beschuldigen ihn, Amelia entführt zu haben. Auf dem Höhepunkt der Szene taucht Amelia selbst auf und beteuert die Unschuld des Dogen; sie berichtet von ihrer Entführung, weigert sich aber, den Namen des Verantwortlichen zu nennen. Alle Anwesenden fordern einstimmig, dass der Übeltäter vor Gericht gebracht werde. Paolo beauftragt Pietro, Adorno und Fiesco, die er wegen Verrat hat einsperren lassen, aus ihren Zellen zu holen. Paolo dringt in Fiesco, Boccanegra im Schlaf zu töten. Als dieser sich weigert, wird er in den Kerker zurückgebracht. Gegenüber Adorno deutet Paolo an, Amelia sei in die Gemächer des Dogen gebracht worden, weil sie seine Geliebte ist; so hofft er, Adorno zur Ermordung Boccanegras aufstacheln zu können. Wieder allein gelassen, ergeht Adorno sich in Rasereien gegen Boccanegra. Amelia tritt ein. Adorno beschuldigt sie der Untreue. Sie kann ihn indes nicht völlig beruhigen, ohne ihm zu offenbaren, dass sie Boccanegras Tochter ist. Boccanegra taucht auf, und Adorno versteckt sich. Als Amelia ihrem Vater sagt, sie sei bereit, für Adorno zu sterben, willigt Boccanegra ein, ihm zu verzeihen, obwohl er der Verschwörung gegen ihn angehört. Boccanegra, jetzt allein, wird von Müdigkeit überwältigt und schläft ein. Adorno will ihn gerade erdolchen, als Amelia zurückkehrt und ihn davon abhält. Boccanegra wacht auf. Er sagt Adorno, dass Amelia seine Tochter ist. Der völlig überraschte Adorno bittet Amelia um Verzeihung und schwört dem Dogen Treue bis in den Tod. Rufe werden laut; der Aufstand hat begonnen. Boccanegra fordert Adorno auf, sich seinen Kampfgefährten anzuschließen, doch dieser stellt sich bedingungslos auf die Seite des Dogen. Boccanegra befiehlt Adorno, dem Kämpfen Einhalt zu gebieten: Wenn es ihm gelingt, bekommt er Amelia als Lohn. Die Erhebung ist niedergeworfen. Adorno hat sich in Boccanegras Diensten ausgezeichnet und erhält seinen Lohn. Pietro flüstert, dass er alles vorbereit hat, und Paolo gibt Befehl zur Ermordung Boccanegras. Ein Hochzeitschor ist zu vernehmen. Paolo vertraut Fiesco an, dass er Boccanegra vergiftet hat, und rät ihm zu fliehen, wenn er nicht in das Komplott mit hineingezogen werden will. Fiesco ist entsetzt, weigert sich aber zu gehen. Boccanegra erliegt allmählich den Wirkungen des Gifts. Fiesco kommt hinzu und spricht ihn an. Boccanegra erkennt die Stimme seines alten Feindes. Er ist überglücklich, dass sie sich jetzt versöhnen können, und offenbart Fiesco, dass Amelia seine Enkelin ist. Fiesco, von Gewissensqualen überwältigt, deckt Paolos Verrat auf. Adorno und Amelia kommen von ihrer Vermählung und finden ehemalige Feinde im Frieden miteinander. In einer letzten Kraftanstrengung vertraut Boccanegra Amelia an, dass Fiesco nicht ihr Vormund ist, sondern ihr Großvater. Noch im Sterben ernennt er Adorno zu seinem Nachfolger als Doge. L’opera si svolge a Genova, all’epoca in cui la città era governata da opposte fazioni di patrizi e plebei. Su uno sfondo di conflitti politici campeggia l’inimicizia personale tra il plebeo Simon Boccanegra e il patrizio Fiesco. Boccanegra è un famoso corsaro, che ha combattuto con successo contro i nemici di Genova. Si è innamorato di Maria, figlia di Fiesco, da cui ha avuto una figlia. Fiesco ha vietato alla figlia di sposare un uomo di rango inferiore, e l’ha imprigionata nel suo palazzo; la bambina viene allevata da una nutrice fuori città. Il crudele atteggiamento di Fiesco nei confronti di Maria non è un segreto. Il plebeo Paolo progetta di sfruttare l’amore di Boccanegra per Maria per assicurarsi il potere. Paolo e Pietro parlano delle nomine per la candidatura dei plebei alle prossime elezioni del doge. La scelta di Paolo cade su Simon Boccanegra. Quando l’uomo arriva, Paolo lo convince a candidarsi: se verrà eletto, Fiesco non potrà più rifiutargli la mano di Maria. Pietro raduna una folla di cittadini e li convince ad appoggiare Boccanegra. Fiesco esce dal suo palazzo. Maria è morta e il nobile giura vendetta contro l’uomo che ha distrutto la sua famiglia e gli ha portato via l’amata figlia. Compare Boccanegra e Fiesco lo affronta, senza dirgli che Maria è morta. Boccanegra propone una riconciliazione, ma Fiesco dichiara che gli perdonerà solo se Boccanegra gli lascerà la nipotina. Boccanegra rifiuta e spiega che la bambina è scomparsa. I due uomini si lasciano incolleriti. Fiesco fa in modo che sia Boccanegra a scoprire il cadavere di Maria. In questo momento entra la folla che lo acclama nuovo doge. Sono passati 25 anni. Il doge ha esiliato molti dei suoi avversari politici, confiscandone i beni. Uno di questi nemici è Fiesco, che adesso vive nel palazzo dei Grimaldi e complotta con i nobili per rovesciare Boccanegra. Anni prima la famiglia Grimaldi aveva scoperto un’orfana in un convento e l’aveva adottata, senza avere alcuna idea della sua vera identità (è la figlia di Maria e Boccanegra). I Grimaldi la fanno passare per la figlia Amelia, morta da poco, nella speranza di lasciare a lei in eredità il patrimonio familiare, dopo l’esilio dei figli maschi. Amelia aspetta il suo innamorato, Gabriele Adorno, un nobile il cui padre è stato ucciso da Boccanegra. Sospettando che sia coinvolto in una congiura politica contro il doge, Amelia lo ammonisce delle possibili conseguenze. Viene annunciata un’imprevista visita del doge. Nel timore che sia venuto per obbligarla a sposare Paolo, Amelia spinge Adorno a chiedere a Fiesco il permesso per le loro nozze. Arriva Fiesco e acconsente, rivelando ad Adorno che Amelia è adottata. Adorno è sempre deciso a sposarla e i due escono. Entra Boccanegra e concede il perdono ai fratelli esiliati di Amelia, con grande sorpresa della donna. Amelia confessa di amare Adorno e di non voler sposare Paolo; inoltre rivela di essere stata adottata e narra quello che sa della sua infanzia. Il doge si rende conto che è lei la figlia che credeva perduta. I due sono sopraffatti dalla gioia di essersi ritrovati. All’arrivo di Paolo, Boccanegra gli ordina di rinunciare all’idea di sposare Amelia. Furibondo, Paolo organizza il rapimento della donna. Tra i festeggiamenti al porto, compare il doge e viene interrotto da Fiesco e Adorno che lo accusano di aver rapito Amelia. Nel momento culminante della scena compare la donna in persona e protesta l’innocenza del doge; narra del suo rapimento, ma rifiuta di rivelare il nome del responsabile. Tutti a gran voce chiedono giustizia contro il rapitore. Paolo chiede a Pietro di chiamare Adorno e Fiesco, da lui arrestati per tradimento. Poi sollecita Fiesco ad assassinare Boccanegra nel sonno. Il nobile rifiuta e viene ricondotto nella sua cella. Paolo insinua ad Adorno che Amelia è stata condotta nell’appartamento del doge perché è la sua amante; spera così di spingere il giovane a uccidere Boccanegra. Rimasto solo, Adorno dà sfogo alla sua ira contro il doge. Entra Amelia e Adorno l’accusa di infedeltà. La donna non riesce a rassicurarlo completamente senza rivelargli la sua vera identità. Si avvicina Boccanegra e Adorno si nasconde. Quando Amelia confessa al padre che è disposta a morire per Adorno, Boccanegra accetta di perdonarlo, anche se il giovane è coinvolto nella congiura contro di lui. Rimasto solo, Boccanegra si addormenta, sfinito. Adorno sta per pugnalarlo quando Amelia ritorna per fermarlo. Boccanegra si sveglia e rivela ad Adorno che Amelia è sua figlia. Stupito, Adorno supplica Amelia di perdonarlo e giura fedeltà al doge. Si sentono delle urla: è iniziata la rivolta. Boccanegra ordina ad Adorno di raggiungere i suoi compagni, ma Adorno si rifiuta. Boccanegra gli ordina di spegnere la sommossa: se ci riuscirà, Amelia sarà la sua ricompensa. La rivolta è stata domata. Adorno si è distinto al servizio di Boccanegra e sarà ricompensato. Pietro sussurra di avere tutto pronto e Paolo ordina l’assassinio di Boccanegra. Al suono di un coro nuziale, Paolo rivela a Fiesco di aver avvelenato il doge: Fiesco deve fuggire se non vuole essere implicato. L’uomo inorridisce, ma rifiuta di andarsene. Adesso Boccanegra comincia a risentire degli effetti del veleno. Fiesco si fa avanti e lo affronta. Boccanegra riconosce la voce del vecchio nemico. Sopraffatto dalla gioia di potersi finalmente riconciliare, rivela a Fiesco che Amelia è sua nipote. Oppresso dal rimorso, il nobile rivela il tradimento di Paolo. Arrivano Adorno e Amelia dopo le nozze e trovano i due nemici ormai in pace. Boccanegra fa appello a tutte le sue forze per dire ad Amelia che Fiesco non è il suo tutore, ma suo nonno e con l’ultimo respiro nomina Adorno suo successore alla carica di doge. L’histoire se déroule à Gênes à une époque où la ville était dominée par des groupes rivaux de patriciens et de plébéiens. L’inimitié personnelle entre le plébéien Simon Boccanegra et le patricien Fiesco se joue dans le cadre de ce conflit politique. Boccanegra est un fameux corsaire qui a mené des attaques réussies contre les ennemis de Gênes. Il est tombé amoureux de Maria, la fille de Fiesco, et ils ont eu un enfant. Fiesco a interdit à sa fille d’épouser Boccanegra en raison de sa basse extraction et l’a enfermée dans son palais; le bébé est élevé par une nourrice en dehors de la ville. L’attitude cruelle de Fiesco envers Maria est de notoriété publique. Paolo, un plébéien, projette d’exploiter l’amour de Boccanegra pour Maria afin de prendre lui-même le pouvoir. Paolo et Pietro discutent de la nomination des candidats plébéiens à l’élection du doge. Paolo a choisi Simon Boccanegra. Celui-ci arrive. Paolo le persuade de se présenter : s’il devient doge, Fiesco ne pourra plus lui refuser la main de sa fille. Pietro rallie une foule de citoyens qu’il persuade de soutenir Boccanegra. Fiesco sort de son palais. Maria est morte et il crie vengeance contre l’homme qui a détruit sa famille et pris sa fille bien-aimée. Boccanegra apparaît et est affronté par Fiesco, qui ne lui parle pas de la mort de Maria. Boccanegra lui offre la réconciliation, mais Fiesco lui répond qu’il ne lui pardonnera que si Boccanegra le laisse avoir sa petite-fille. Boccanegra refuse, expliquant que l’enfant a disparu. Les deux hommes se séparent fâchés. Fiesco laisse Boccanegra découvrir le corps de Maria. C’est alors que le peuple afflue, acclamant Boccanegra comme le nouveau doge. Vingt-cinq ans ont passé. Le doge a exilé de nombreux opposants politiques, après leur avoir confisqué leurs biens. Parmi ces ennemis, Fiesco, parti vivre dans le palais des Grimaldi, complote avec d’autres nobles de renverser Boccanegra. Quelques années plus tôt, les Grimaldi ont découvert une orpheline dans un couvent. Ne connaissant pas sa véritable identité – c’était la fille de Maria et de Boccanegra –, ils l’ont adoptée. Ils espéraient qu’en prétendant que c’était leur fille Amelia, qui venait de mourir, ils auraient au moins une héritière pour leur fortune, leurs fils ayant été exilés. Amelia attend son bien-aimé, Gabriele Adorno, noble dont le père a été tué par Boccanegra. Le soupçonnant d’être impliqué dans une conspiration politique contre le doge, elle l’avertit des éventuelles conséquences. Une visite inattendue du doge est annoncée. Amelia, craignant qu’il soit venu pour la forcer à épouser Paolo, presse Adorno de demander sa main à Fiesco. Celui-ci arrive; il donne son consentement tout en racontant à Adorno que la jeune fille a été adoptée. Cette nouvelle ne décourage pas Adorno. Les deux hommes s’en vont. Boccanegra entre. Il surprend Amelia en accordant le pardon à ses frères exilés. Elle avoue qu’elle aime Adorno et ne se mariera pas avec Paolo. Elle dit à Boccanegra qu’elle a été adoptée et quand elle lui raconte ce qu’elle sait de sa petite enfance, il comprend qu’elle est bien sa fille disparue depuis si longtemps. Ils sont fous de joie de s’être retrouvés. Lorsque Paolo arrive, Boccanegra lui dit de renoncer à épouser Amelia. Furieux, celui-ci manigance de la faire enlever. En pleines fêtes du port, le doge apparaît et est interrompu par Fiesco et Adorno qui l’accusent du rapt d’Amelia. Au plus fort du drame, Amelia entre en scène, clamant l’innocence du doge. Elle raconte son enlèvement, mais refuse de révéler qui en est l’auteur. Tous se mettent à exiger que le coupable soit traduit en justice. Paolo dit à Pietro d’aller chercher Adorno et Fiesco, qu’il a arrêtés pour trahison. Paolo exhorte Fiesco à assassiner Boccanegra dans son sommeil. Fiesco refuse et est ramené à son donjon. Paolo, en suggérant à Adorno qu’Amelia a été conduite dans les appartements du doge parce qu’elle est sa maîtresse, espère à présent l’inciter à tuer Boccanegra. Resté seul, Adorno peste contre Boccanegra. Amelia arrive. Adorno l’accuse de lui être infidèle. Or, elle ne réussit pas à le rassurer complètement sans lui révéler qu’elle est la fille de Boccanegra. Alors que ce dernier s’approche, Adorno se cache. Quand Amelia dit à Boccanegra qu’elle aime Adorno à en mourir, Boccanegra accepte de lui pardonner, bien qu’il ait participé à la conspiration contre lui. Boccanegra, seul et fatigué, s’endort. Adorno est sur le point de le poignarder lorsque Amelia revient et l’en empêche. Boccanegra se réveille. Il dit à Adorno qu’Amelia est sa fille. Adorno, stupéfait, supplie Amelia de le pardonner et voue sa vie au doge. On entend des coups de feu. La rébellion a commencé. Boccanegra invite Adorno à rejoindre ses compagnons, mais celui-ci fait serment d’allégeance au doge. Boccanegra lui ordonne alors de réprimer le combat : s’il y parvient, il aura Amelia en récompense. Le soulèvement a été étouffé. Adorno s’est distingué au service de Boccanegra et va être récompensé. Pietro laisse entendre qu’il a tout préparé et Paolo donne l’ordre d’assassiner Boccanegra. On entend un chœur nuptial. Paolo dit à Fiesco qu’il a empoisonné Boccanegra et qu’il devrait s’enfuir s’il ne veut pas être impliqué. Fiesco est horrifié mais refuse de partir. Boccanegra est en train de succomber aux effets du poison. Fiesco s’approche et lui fait face. Boccanegra reconnaît la voix de son vieil ennemi. Il est ravi de pouvoir se réconcilier et dit à Fiesco qu’Amelia est sa petite-fille. Fiesco, accablé par le remords, lui révèle la traîtrise de Paolo. Adorno et Amelia reviennent de leur mariage pour découvrir les deux vieux ennemis en paix. Boccanegra trouve la force de dire à Amelia que Fiesco n’est pas son tuteur, mais son grand-père. Tandis que Boccanegra se meurt, il fait d’Adorno son successeur en tant que doge.